Common Table Expressions (also known as CTEs) provided a way to create an ad hoc set of records, and then immediately do something with it. CTEs were introduced in SQL Server 2005, so if you're still using SQL Server 2000, you can stop reading now! 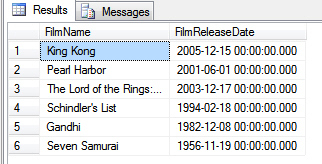 The results of running the query above - a list of the films in this table lasting more than 3 hours. The obvious question is - why bother to divide this into two parts, when you could have done the whole thing with a single query? using a CTE will nearly always make a query easier to understand. Common Table Expressions allow you to divide a query into parts, and hence simplify problems. While they're rarely essential, I like them because they enable me to get my head round complicated queries. I think CTEs are much easier to understand! However, if you are going to use CTEs, you need to be aware of three common traps that you can fall into - so it's worth reading the next part of this blog!